Update 8/28/2015: The features described in this article have been removed and this article is no longer relevant. Please visit this article for related information on payment collection and estimation. Expected Turn is the amount of time in actual days MCA Suite (the Funder) expects the Merchant to repay the Actual Expected Payback. In other words, it is the number of days it takes a Funder to recover the Purchased Amount (or RTR or the Advanced Amount plus Factor). 1. The Funder makes an offer to a Merchant to provide the business an advance of $10,000 with 1.22 factor which makes the Expected Payback (RTR or Purchased Amount) to be $12,200. The Funder is also assuming the Merchant will be making 22 payments per month at $100 per day which makes the Estimated Turn (the amount of time the Funder expects the Merchant to repay the Payback Amount) to be 167 days (how is Estimated Turn Calculated?). 2. The Funder funds the Merchant on April 1, 2015. Today is April 13, 2015 which means 12 actual days have elapsed since the funded date. Over the past 12 days, the Merchant has made 8 payments at $100 per payment ($800). To calculate Expected Turn, we must first calculate the Average Daily Payment made by the Merchant and account for the Payments Per Month in the equation. The Average Daily Payment is made up of the sum of all payments made by the merchant (Amount Repaid) divided by the total number of days that have elapsed since the Funded Date. Whether the Funder is collecting via ACH or Split Funding, the frequency of payments will vary by Merchant and month to month. MCA Suite allows you to define the number of Payments Per Month for each deal and factor that into the Expected Turn equation for a more accurate calculation. For example: if we expect it to take 44 payments to repay a loan but we only collect 22 payments in a month, it should actually take 2 months (60 days) for the merchant to fully repay that loan - NOT 44 days. 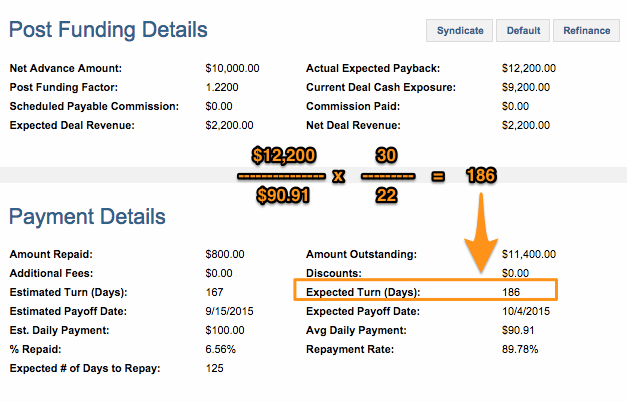 Below is an example of how MCA Suite calculated for this deal. 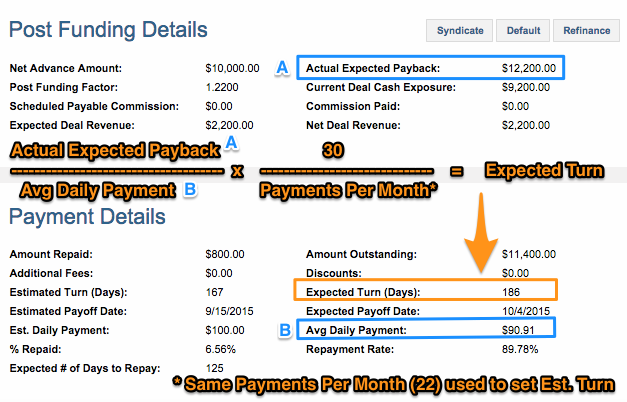 MCA Suite will use the Expected Turn value with the Funded Date to arrive at an Expected Date the Merchant will pay off the Actual Expected Payback (or what some call RTR or Purchased Amount).